Jurisdictional approaches to sustainable development hold tremendous potential for advancing holistic, durable solutions to the intertwined issues of tropical deforestation, rural livelihoods, and food security. With many jurisdictional “experiments” underway around the world, the time is ripe for a systematic assessment. A global assessment of jurisdictional sustainability is being conducted through a partnership between Earth Innovation Institute, CIFOR, and the Governors’ Climate and Forests Task Force, with participation from Sustainable Tropics Alliance members. The full report will be released in September 2018, but a preview is available now. The preview report includes analytical briefs about each jurisdiction, as well as an overall synthesis of jurisdictional sustainability across the tropics. 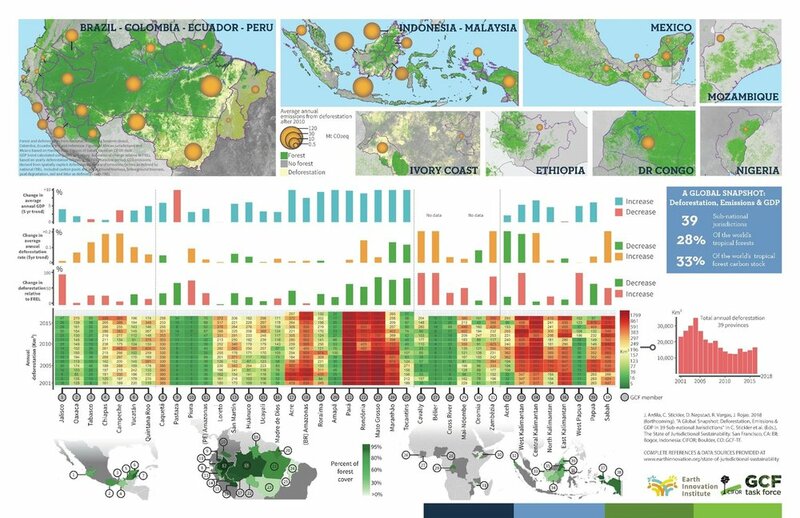 This preview report offers a synthetic view on the spatial-temporal variation of key indicators on forest protection and economic output in 39 tropical jurisdictions.